If you’ve been trapped in a cave for the last few years, there’s a chance you haven’t heard of Jim and Mike Ring. You need to get caught up to speed, because the Ringbrothers have been churning out some of the greatest custom machines of late. From their carbon fiber-bodied Mustang to that nasty Chevelle known as Recoil, it’s been a string of truly excellent custom cars. Now the duo are ready to bring a whole new lineup to SEMA, along with one familiar face. At the moment, we only have renderings of the three new vehicles bursting forth from the Ringbrothers’ Spring Green, Wisconsin stables. 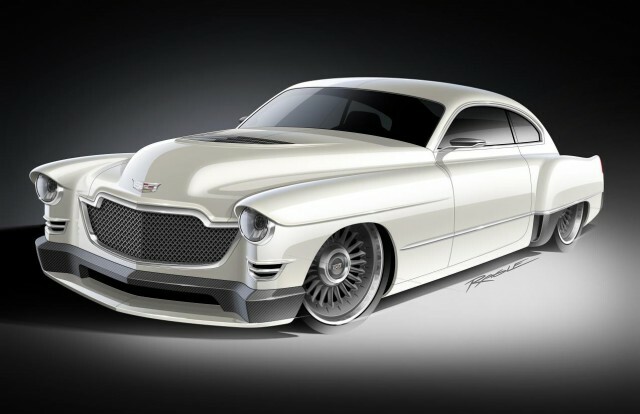 First up is a 1948 Cadillac being dubbed Madam V. It seems that Mike and Jim managed to use a pair of new ATS-V Cadillacs and work their magic into the steel-bodied ’48. Why they needed two is quite curious. Could this be a dual-engined freak machine? Anything’s possible with these guys. Next up is a car referred to as G-Code. It’s just the second 1969 Chevrolet Camaro that the Ringbrothers have laid their hands on, and this one is packing the expected heat. Under the hood sits a supercharged LS3 6.2-liter V-8. The lines of the car have been reworked a bit to make it stand out, and there’s apparently a ton of billet products to be on display with this one. Another Mustang is also making the trip to Las Vegas. It’s a 1965 convertible, and it’s called Ballistic. This car wears a full wide-body kit, and it’s powered by a 5.8-liter V-8 engine plucked from a Shelby GT500. Normally, a Ringbrothers car is unveiled in the booth of a sponsoring product, but this Mustang will be the first one unveiled in the builders’ own booth. Finally, the brothers are bringing an aforementioned familiar machine back to SEMA. It’s their 1972 Winnebago dubbed Happy Camper. This remains one of our favorite vehicles out there, as it’s a patina-wearing party machine that happens to have over 900 horsepower on tap. It looks like the 2016 SEMA show is shaping up to be an entertaining scene, and that’s partly due to what the Ringbrothers are trekking along with them. The action will all unfold in Las Vegas from November 1-4.